Wide rayon fluid moving fringe trim. Custom kit includes 38” (96.5 cm) X 4” (10.2 cm).. 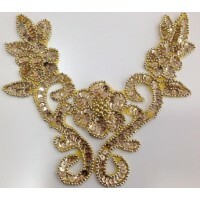 Custom kit includes 12 iridescent sequin flowers and 2 yards (183 cm) of coordinating sequin trim. .. Custom kit includes 12 pink satin rosettes and 2 yards (183 cm) of coordinating sequin trim. made.. Custom kit includes 3 premium pink sequin and pearl appliqués with 3 yards (275 cm) of coordinating .. This custom kit includes 38" wide of genuine feather fringe trim. ONE SIZE ..
ΓΝΗΣΙΑ ΦΤΕΡΑ ( ΠΟΥΠΟΥΛΟ ) 37cm ..
ΓΝΗΣΙΑ ΦΤΕΡΑ ( ΠΟΥΠΟΥΛΟ ) ME ΣΤΡΑΣ 60cm ..
ΣΕΤ ΡΑΒΔΑΚΙ ΜΕ ΦΤΕΡΑ ΠΕΤΑΛΟΥΔΑΣ..
ΣΕΤ ΡΑΒΔΑΚΙ-ΦΤΕΡΑ-ΦΟΥΣΤΑΚΙ ΟΝΕ SΙΖΕ ..